The densification algorithm identifies the critical points in a Kriging result. Therefore, the densification result indicates the approximate locations of the people whose samples will be collected by responders in the next iteration. If the software reccommends to continue the iterative process (see the previous section), the next step is to densify the Kriging result of the current iteration. 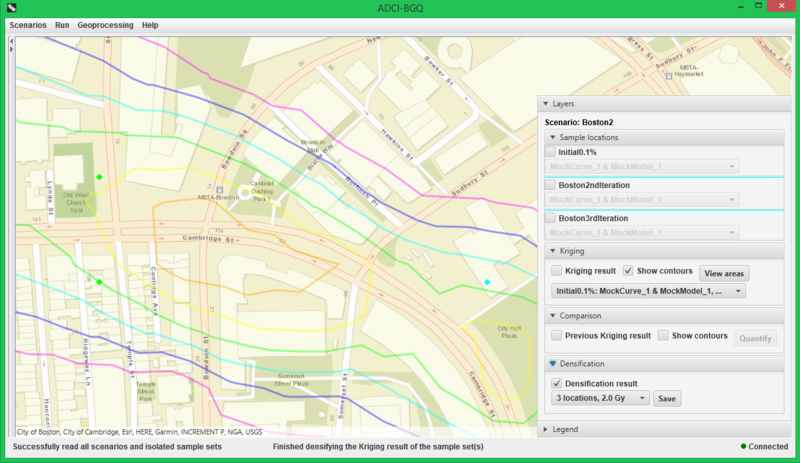 To do this, click the ‘Densify Kriging result’ menu item under the ‘Geoprocessing’ menu, then you will need to enter two parameters (number of locations to sample, the dose threshold that the area with doses above it will be used to sample from) in two pop-up dialogs. If this Kriging result is being densified for the first time using this parameter setting, a progress dialog will appear. The densified points will be displayed on the map with diamond shapes (see the following figure). Their colors also indicate the dose ranges within which their estimated doses in the Kriging result lie. A 'Densification' pane will also appear in the bottom-right control accordingly. Unchecking the 'Densification result' checkbox will hide the densified points from the map. By clicking the ‘Save’ button, you can save the coordinates of the densified locations and their estimated doses into a local file. On the same Kriging result, you can use another parameter setting to perform a new densification process. The new parameter setting will also appear in the drop-down list in the 'Densification' pane, which is used to switch between Densification results. Furthermore, under the same parameter setting, different Kriging results may produce different densification results. Thus you can select another item in the Kriging drop-down list to densify a different Kriging result.